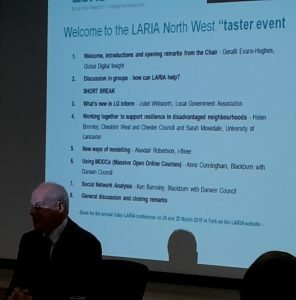 LARIA NW welcomed around 70 delegates to this ‘taster’event in Manchester, chaired by Gerallt Evans-Hughes, to hear from a range of speakers. The event began with discussions in groups, covering customer insight, secondary data/Census, data sharing, public opinion and public health/JSNA. 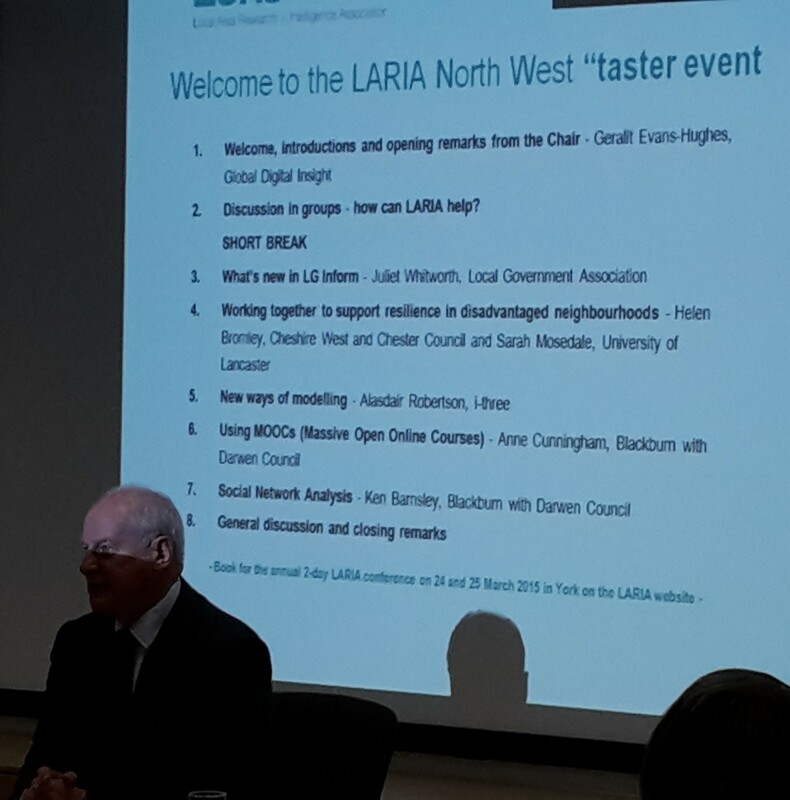 Facilitators noted the issues which LARIA NW will analyse to see if and how LARIA can help. Delegates heard about LG Inform, with an update on the LGA’s data benchmarking service for local authorities and the public. The session covered the developments that are currently underway to the tool, which will help users, both in councils and more widely, to access performance and other information about their areas. We heard about an update of indicators to the free benchmarking tool underway using LG Inform and saw a short demonstration of the product. Delegates were asked to indicate if training in LG Inform (perhaps locally in the North West) would be of interest. 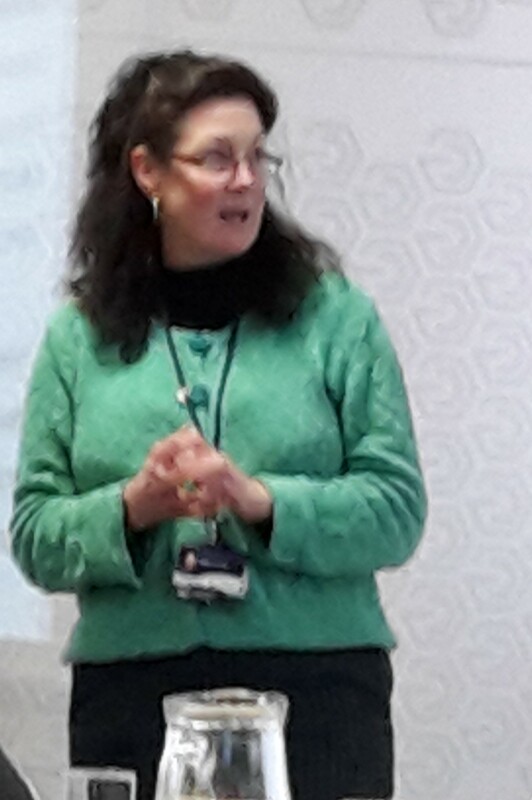 The aim of the presentation was to introduce colleagues to the National Institute of Health Research Collaboration for Leadership in Applied Health Research and Care, North West Coast (NIHR CLAHRC NWC). The collaboration brings universities, local authorities, NHS organisations and the public together – working to accelerate the translation of research findings into health service improvements and changes that will reduce health inequalities and improve population health. The presentation outlined the Public Health work stream within the CLAHRC, and commented on the experience of one local authority (Cheshire West and Chester) taking part in this research programme. This session looked at the use of simulation technology to support evidence based approaches to decision making and stakeholder engagement. The focus was on application of local data to support complex decisions in vital questions of public policy. This approach allows for deeper understanding of the complex and sometimes counter intuitive nature of how issues play out in real world systems, but tested in the safety of the lab before risking implementations. It also discussed how well conceived simulation models can bring together stakeholders in the decision making process. Massive Open Online Courses (MOOCs) have come from nowhere in the past four years to have millions of students worldwide, transforming the opportunity to participate in free or almost-free learning. 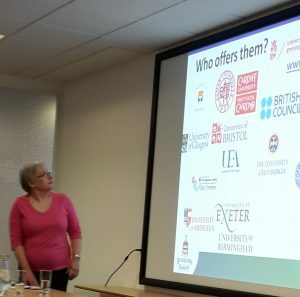 The session introduced some of the leading platforms for MOOC study, and the ever-expanding list of providers and courses on offer. It described the speaker’s own experience of this form of education, and reflected on some of the typical processes, challenges and rewards of Massive Open Online Courses. Finally, it presented a selection of just some of the forthcoming MOOCs which may be of interest to LARIA members. The study looked at the social networks in Little Harwood in Blackburn that create and sustain health and wellbeing. It used a Social Network Analysis approach, training local researchers and co-designing a questionnaire recording tool. This enabled researchers to understand aspects of social neworks in Little Harwood and to begin to map them along with being able to identify nodes in terms of people and places. Austerity and its public spending cuts do not easily support demands for improved outcomes from services. This is true if we continue to think of public services solely as the social and economic support provided by the state through one to one, transactional relationships with the citizen in order to ‘deliver’ solutions to problems. But if we start to think about ‘services’ not just as things provided by the state, but also as wider social attitudes and support; and if we blur the boundaries between state and civil society so that well-designed public services encourage and support rather than crowd out the efforts of families, friends and communities to support (vulnerable) people, then we move to a more co-productive model in which the latent assets in communities to provide social and economic support are better used. Social networks, however, do not restrict themselves to purely social or economic domains. More broadly, this work explored the question of how can we better understand, configure and mobilise the total set of assets in networks to achieve outcomes. This led towards trying to understand networks as production systems for social (and economic) value. For BwD, networks are comprised of individuals, groups, places and institutions connected through a variety of dimensions, be they geography, interest, practice, activity, or chance. BwD are interested in what makes networks more socially and economically productive for both the individuals and institutions within them, and for society as a whole. This kind of approach tries to work with how the world is, in all its complexity, rather than how we might idealise or simplify it for the sake of designing policy and practice.